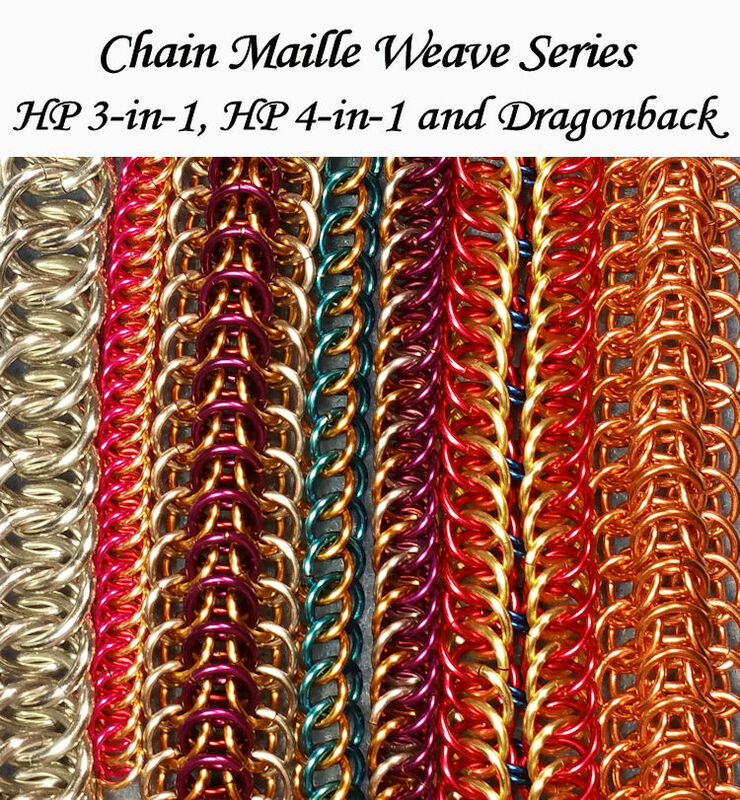 The chain maille HP (Half Persian) weaves are intriguing and DragonBack is exciting! Well, at least that’s my opinion. How a person can take the small rings and make such a densely-woven piece of jewelry was amazing to me. Welcome to the HP world! I know that HP has the reputation of being difficult, but it really isn’t — at least not without a little help in the very beginning (which of course I provide). Then like most weaves, once you have the rhythm, it’s not all that hard at all! There are lots of very detailed photos to show you what ring goes where. We’ll start out with the easiest of the weaves — the HP3in1. With a couple of tips in the very beginning on how to start the weave, it becomes a whole lot easier! Once you have the hang of that weave, time to move onto the HP 4in1. This is a beautiful, very dense weave. Once again I provide two different ways to start out the weave to make things that much easier! Do you want to double your fun? How about a doubled HP 4in1! It’s actually pretty easy, and it’s reversible in a way that can give you two different looks. We’ll finish up with DragonBack, which is a weave that is rather unusual and not often seen. 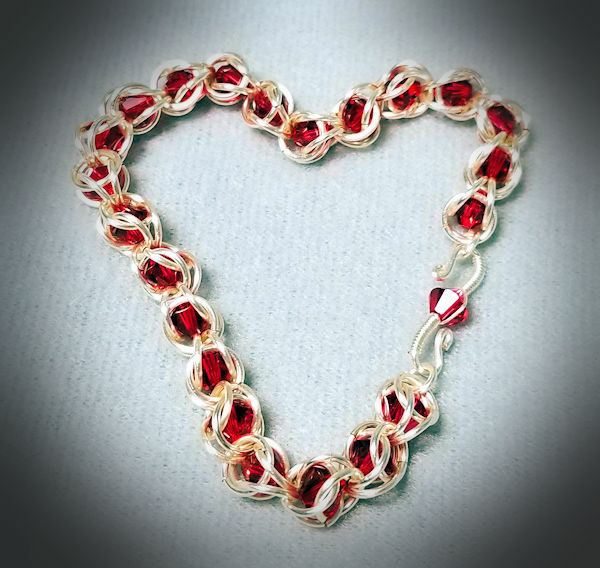 It, too, is a dense weave, and it makes a very substantial piece of jewelry. Not to mention an absolutely gorgeous one! But please note — DragonBack and the more commonly-seen DragonScale are not the same weave. In this ebook I teach you DragonBack. With these weaves, I demonstrate each weave in at least two different color rings, so you can more easily see how the weave is put together. I also show some common mistakes, how to recognize them quickly and how to fix them. There’s lots in the ebook. It’s 37 pages and has 79 photos, so you have a lot of instructions and plenty of close-ups. The photo at the top of the page shows all the weaves you’ll find in this ebook tutorial. This ebook is in PDF form, and is just a little over 1.6 MB in size. The ebook is just $6, which is a small amount for everything you get, especially with the super-close-up photos — which many times I show multiple angles so you are sure where to put that next ring! You can buy the ebook securely through the link below. All major credit cards are accepted. Just as an FYI, it does go through the PayPal interface. You will get a link for an immediate download — and then you’re on your way! 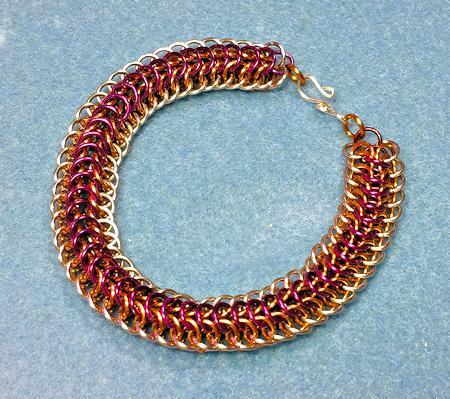 Thanks so much for reading this far, and happy maille-ing! 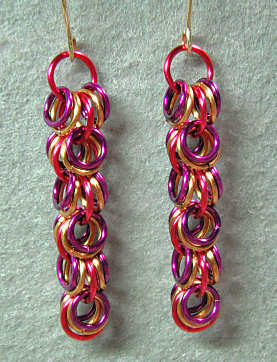 This Shaggy Loops chain maille video tutorial is for a pair of earrings in this fun chainmaille jewelry pattern. It’s simple but fun, and it can be dressed up or down in so many ways. This particular weave is best used in earrings. Not that you can’t use it to make bracelets or necklaces, but the pattern shows itself best when hanging vertically. 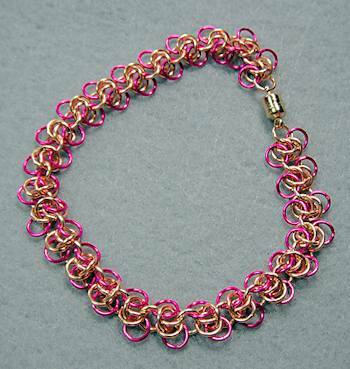 This video tutorial is for the basic pattern, which is the gold and black version. I also show two additional variations and talk about how I made them. 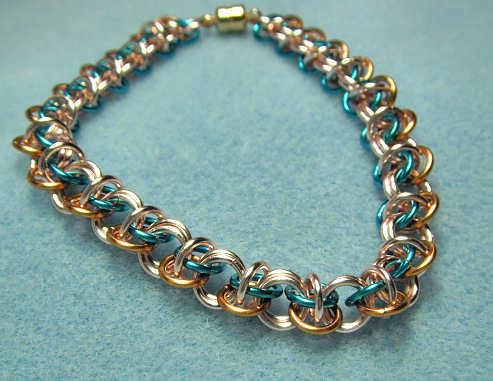 The base of this chain maille jewelry pattern is a simple one-in-one (sometimes called 2-in-2) chain. It’s as basic as you can get — putting one through through another. The “shag” is the extra loops you place on the base chain. These loops only go through one jump ring. The supplies for the base pattern (the black and gold photo) are as follows. If you want the supply info on the two variations I show, the list for these is below the video. So start by watching the video and then take a look at the supplies for the others if you like.